London is a furrtastic place to live with a pet. There are many parks to walk and play with animals. Some of them are even off-leads areas (a “lead” is a British word for “leash”) which is awesome. There are dozens of pubs, shops and other establishments that are pet-friendly. London is one of the few cities where you can see a dog taking a bus. Yes, that is a thing and that’s very much allowed. Alas, all of those things are available to people already living in London. Moving in with a pet can be quite a chore. Reality check here: London is a massive megalopolis with countless prosperous opportunities for a whole bunch of people. It is filled to the brims with students, temporary workers, artists, tourists and freelancers. All of those people need a place to live. All of them generate a massive demand for a minimal supply. Landlords in London don’t need to chase their clients. On the contrary – they can pick whichever they like most. As you might have guessed, a lot of them go for the easier route and simply don’t except people with pets. You don’t have to worry about that too much as with our network of over 80 agencies we will find a home for you and your furry friend in no time. You still have to be ready to face a challenge. Our first lifehack isn’t even related to London, but rather to the airlines you’ll choose for travel. Please check all of the necessary specifications. Some airlines are more specific than others when it comes to crates. Certain sizes and/or materials can be forbidden. 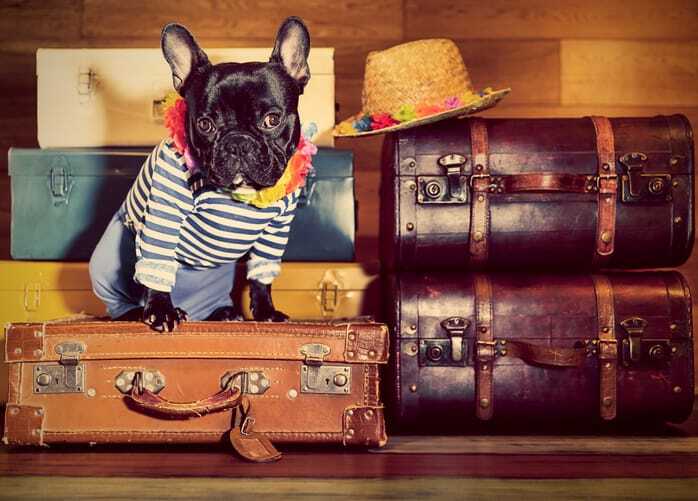 There are some airlines that demand your pet to stay at the airport for a night or two. They believe that animals will get used to the commotion this way. Such drastic measures are definitely an overkill. You can avoid them by reading about necessary requirements before booking a flight. It may seem harsh to keep your pup or kitten at the airport overnight but they still need their sweet time for getting used to the carte. It would be wise to introduce your container to the animal as early as possible. Have some fun with the “temporary home” a few weeks in advance and make sure that your animal feels fine and dandy inside the crate. There are lots of options on Amazon so this shouldn’t be an issue. Your animal companion needs a Pet Passport. Ask your vet for it if you are from an EU country and request a Third Country Approved Veterinary Certificate is you are not. The latter option also requires additional documents you’ll need to gather so get ready for some intense running around for paperwork. Your pet also needs to be microchipped for it to be allowed into the United Kingdom. Do note to get the vaccine from rabies after you microchip your friend. Otherwise, you will have to do it again. PS: If you are a dog owner you will also need the tapeworm treatment done in a couple of days before moving in. The name of the medicine is to be documented in the Pet Passport. There are a lot of times when a landlord states that he has a “no pets policy” on an otherwise perfect apartment or flat and people move on sadly looking for alternatives. This brings us to the lifehack number two: a landlord’s “no” is not set in stone. If you really love the place and the neighborhood and whatnot – negotiate. Try meeting the market price instead of low-balling or agree to an additional fee if your budget allows it. Everything is negotiable. Unless it’s not. If the building itself has a “no pets policy” then it is the end of the line for this property. A landlord has no say in this. We tend to show our clients a lot of properties in one day so we can settle on the perfect one fast. This is an awesome timesaver, but, in turn, the process takes a lot of traveling around the city. It is best for you to keep your friend close otherwise it might get scared or even run away into an unfamiliar city. Make sure you stay close at all times and have the lead on at all times. It’s easier to find a home that accepts cats or small dogs. It is harder and more expensive to find a place that welcomes massive men’s best friends. Please take this fact into consideration before mapping out the budget. You have your wallet, documents and medications with you at all times, don’t you? Same should be said about your little friend. Pack a box with all the essentials like snacks, blankets or favorite chew toys and keep it at your side. Here are some ideas of what to include. Don’t underestimate the power of familiar tastes and smells. Unpacking the box will make the new place feel more like home to the little joyful fuzzball. Do you have any other tips for moving to London with animals? Please share them in the comments below.